Better still, why not start today since Mom suggested a light lunch at Bills? She wanted to have their Tuna Poke, but unfortunately, the tuna poke she fancied was no longer on the menu. 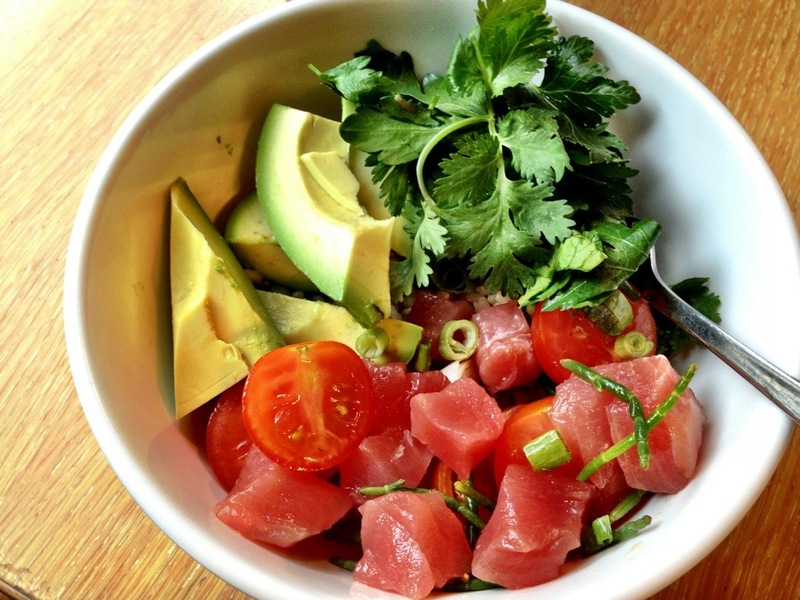 So, here is a piece of iPhoto memory – a bowl of red translucent tuna sashimi slices, avocado, tomatoes, parsley, samphire (those tiny salty crunchy green veggies that grow along the coastal line which ones has to forage), sesame seeds which has barley underneath and seasoned with soy sauce. Bills is a busy cafe, where most of the patrons are ladies (of leisure). 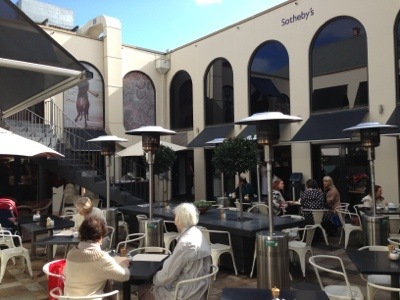 The outdoor sitting area with heaters is a fantastic spot to catch some sun. With the wind chills and spot of drizzle, we opted for indoor seating instead, for that, we had to wait for 20 minutes, so we went shopping. Woollahra is a leafy shopping village with quite a few fashion boutiques (international labels includes Akira, Collete Diningan, et al), organic grocers (e.g Whole Foods, Simon Johnson), home furnishings, antiques dealers and galleries, besides the usual cafes of course. 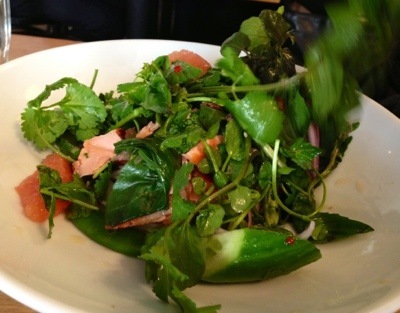 Mom ordered Ocean Trout Salad which had rice vermicelli under the salad of sugar snap peas, watercress, mint and coriander. The grapefruit imparts a sweet tanginess that tarted up the perfect ocean trout. The dressing was a simple dash of fish sauce. As for yours truly who is staying faithful to her ‘diet plans’, I ordered the healthy anti-oxidant superfood of Quinoa Salad. 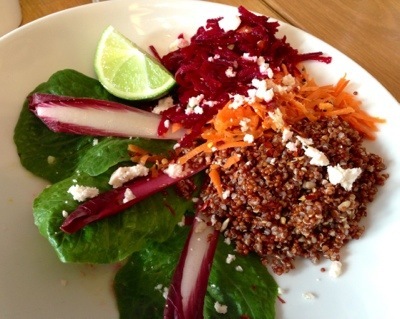 There were a lot of sunflower seeds mixed with the quinoa, the wedge of lime did wonders to furnish sourness to beetroot and carrot shavings on the salad. 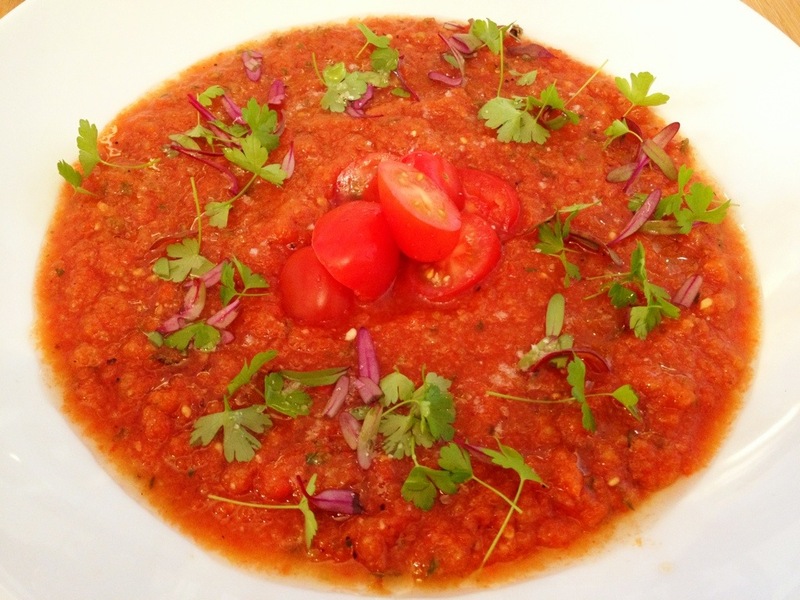 Overall, a satisfying and appetising salad that hope to replicate at home! 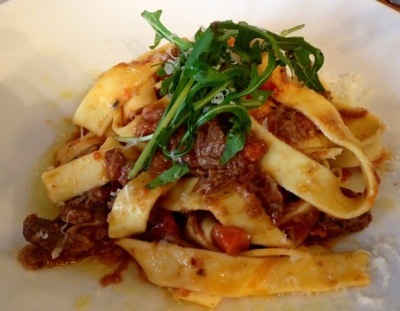 My Bro who joined us for lunch had the more hearty Veal and Pork Ragu Pappardelle. No doubt it was hand-made in the house by the look of the thick unevenly cut pappardelle. It looked small, but was absolutely filling. 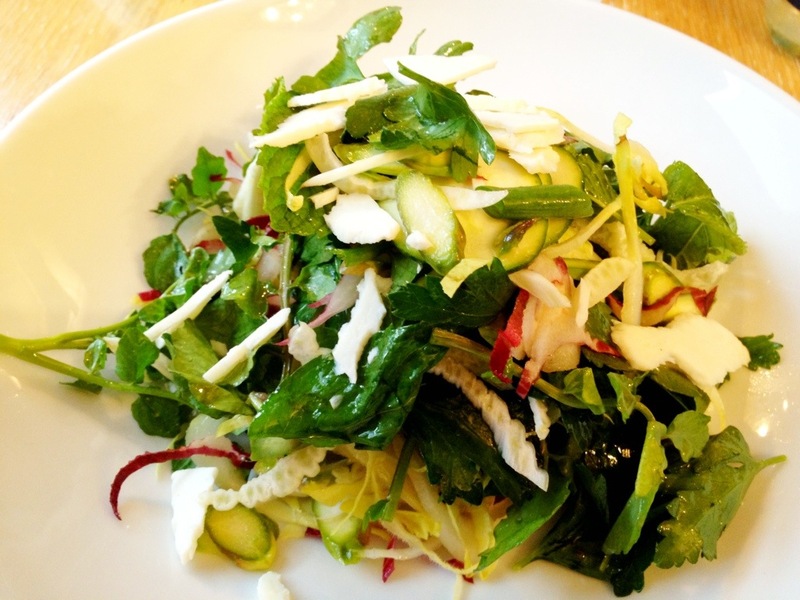 I like going to Bills for light salads which are easy to assemble at home and I often learn a thing or 2 from dining there. A busy cafe has its off-days, and here is a pic of my Raw Green Salad looking totally sub-standard, with 1 piece of chopped bean (yes, I counted! ), bits of veggies and simply tossed up! If one is not a regular, I suppose this is the last straw! An astute businessman, he has his latest cookbook ‘Easy by Bill Granger’ on display. I am at odds whether to get it. His cookings are quite Asianised, little wonder since he was co-owner/founder to Billy Kwong which chef Kylie Kwong later took over. The kimchi rice is very popular and whenever I have visitors from overseas, I would suggest they order this spicy rice dish (with comes with a bottle of Sriracha chilli sauce – the one with a picture of the rooster – and this is pushing the authentic button). However, it was the corn fritters and truffled eggs that made Bills’ name, and they are available in the all-day breakfast menu. Bills has 3 cafes in Sydney and expanding overseas. I often wondered at Japanese tourists who trekked to Woollahra for lunch in his cafe. It only clicked when I saw his one of his cafes in Tokyo. He is one heck of an global entrepreneur indeed – who’d think one can launch an empire from cooking eggs? 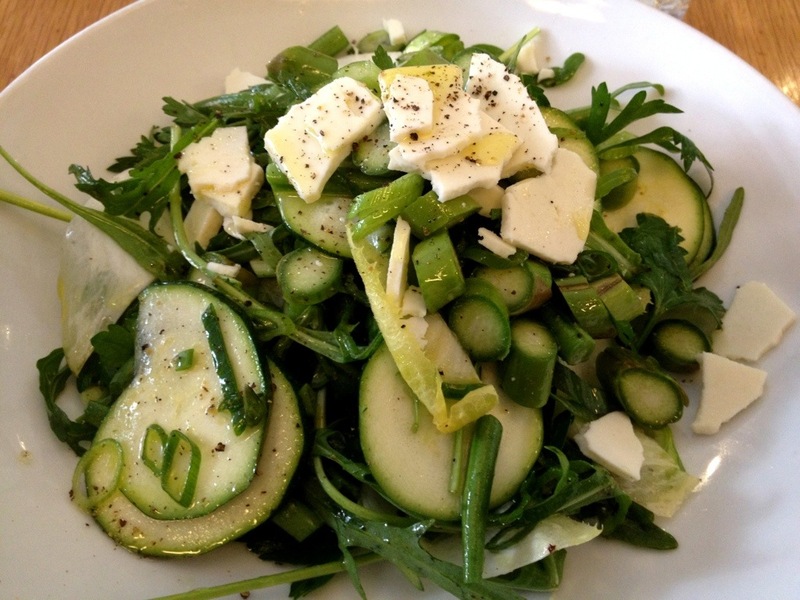 This entry was posted in Cafe, Lunch, Sydney and tagged Bill Granger, Bill's, Lunch, Quinoa Salad, Raw Food, salads, Tuna Poke, Vegetarian, Woollahra. Bookmark the permalink.